Material design is a comprehensive guide for visual, motion, and interaction design across platforms and devices. In this codelab, you'll learn the principles of this design language by building a sample Android app. How to use the Android Design Support Library. How to use the Vector Drawables. 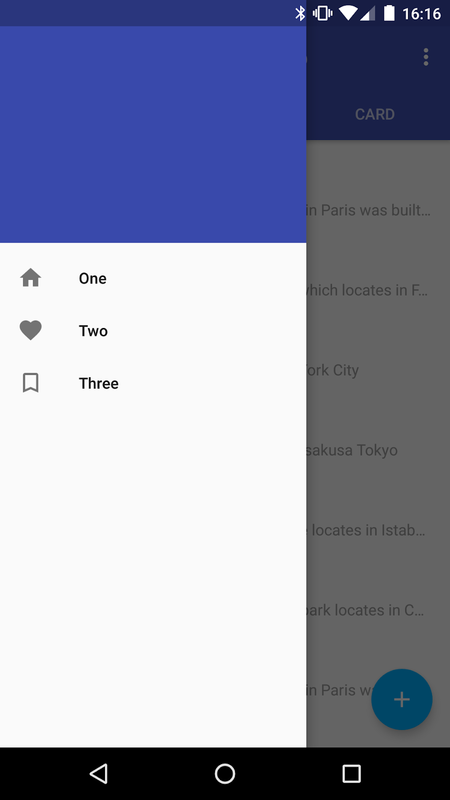 How to apply material design to your Android app. Animation and touch feedback to express meaningful motion. * Android devices running Android 2.3.3 (Gingerbread, API Level 10) or higher may be used, however, some material design effects, such as the ripple effect, will not be visible on devices running on Android 4.4 (KitKat) or before. android-design-library/1-Base—The starting code that you'll build upon in this codelab. 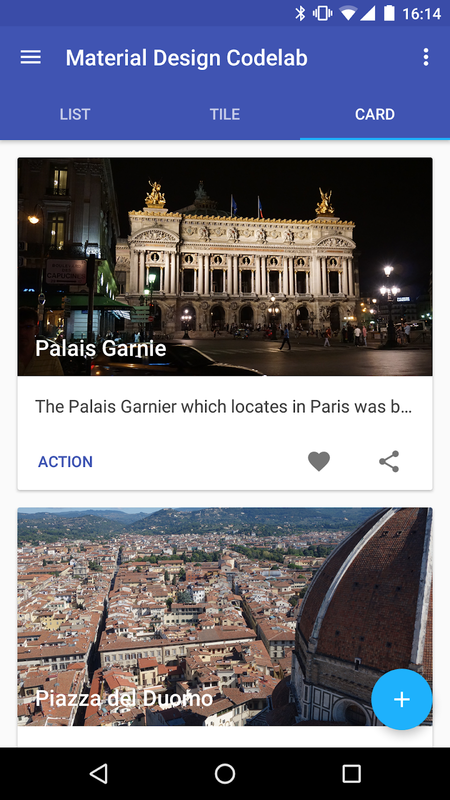 android-design-library/app—The complete code for the finished sample app. First, let's see what the finished sample app looks like. 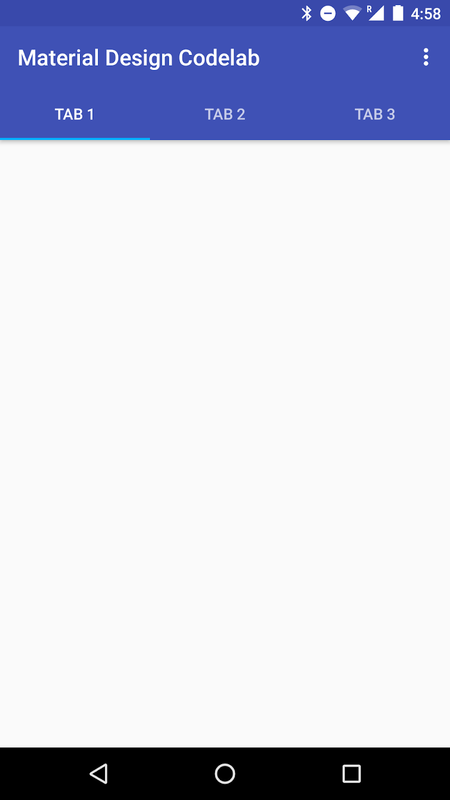 With the code downloaded, the following instructions describe how to open the completed sample app in Android Studio. Select the 1-Base directory from the sample code folder (Quickstart > Import Project... > 1-Base). Plug in your Android device and click the Run button. You should see the App home screen appear after a few seconds. 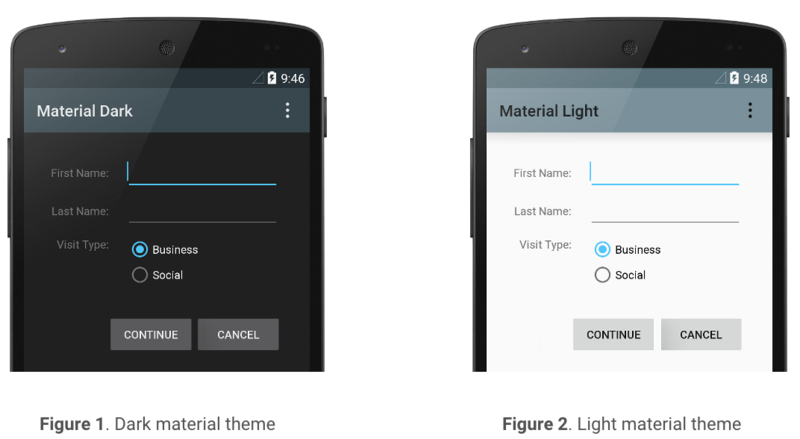 Let's jump right into two key features of material design: Themes and Colors! 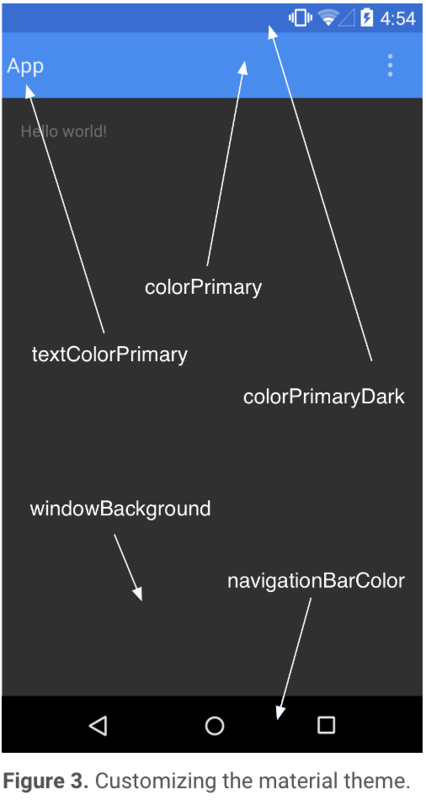 Themes let you apply a consistent tone to an app, and developers can choose between dark or light themes (see Figure 1 and Figure 2). Custom colors can also be defined using theme attributes which are then automatically used by the app for different components e.g colorPrimaryDark for the Status Bar and colorPrimary for the App Bar (see Figure 3 below). 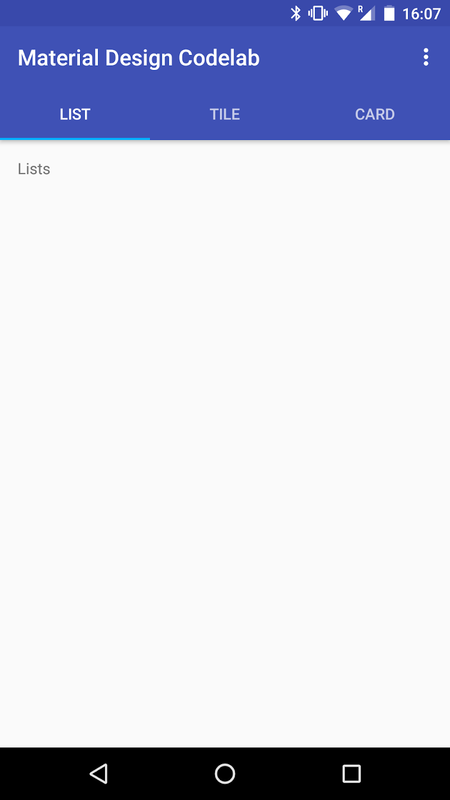 By using attribute parent="Theme.AppCompat.Light.NoActionBar" will remove ActionBar from app. 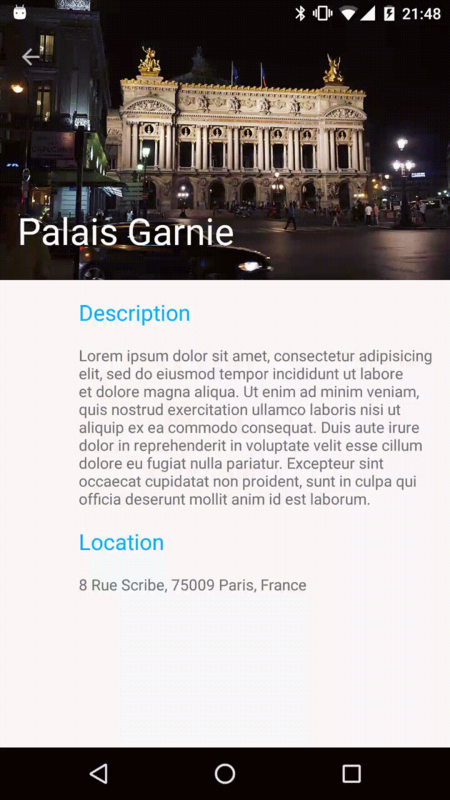 In this step you'll create the basic skeleton of an app, which you'll fill in later by adding material design components. Now you're ready to build on top of the starter project. Import android.support.v7.widget.Toolbar at MainActivity.java and add following codes to add Toolbar to Main screen. For this codelab we are using CoordinatorLayout as a container for child views such as TabLayout and FloatingActionButton. In activity_main.xml remove RelativeLayout and replace with CoordinatorLayout. In order to use Tabs, we will use TabLayout. 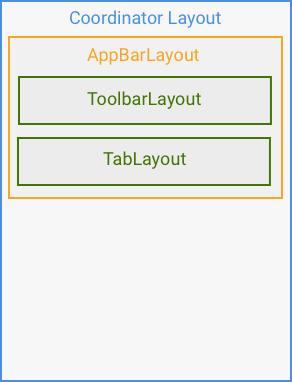 First we will create AppBarLayout then we will place ToolbarLayout and TabLayout within AppBarLayout . You can see code samples from below. In MainActivity.java and add following codes within onCreate method to create tabs. 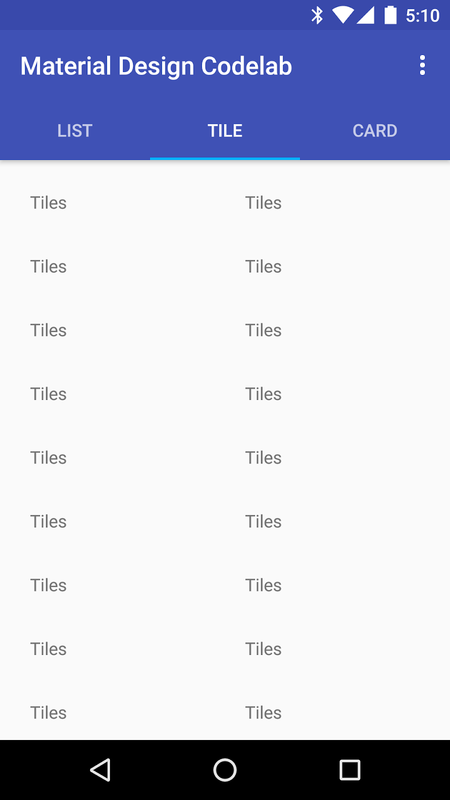 Let's add individual views to the tabs so that when you move between tabs you can have different layouts. Create 3 Fragment java files. ListContentFragment.java , TileContentFragment.java and CardContentFragment.java . Once we created 3 different Fragments files we will now use ViewPager and Adapter to make the content scrollable. In MainActivity.java create a ViewPager variable and Adapter. In activity_main.xml add a ViewPager element outside of AppBarLayout so that AppBar will stay on top of screen while scrolling the views. Create a file defining the layout of each view item_list.xml, item_tile.xml and item_card.xml under res/layout/. Take a look at the individual attributes to see what customizations are available. RecyclerView is a container for displaying large data sets that can be scrolled very efficiently by maintaining a limited number of views. Our data set for this codelab is comprised of empty cards which are pieces of paper that serve as an entry point to more information. Add dependencies to build.gradle to use CardView and RecyclerView. Create recycler_view.xml under the res/layout folder. In each fragment, create and customize the RecyclerView. Start by extending RecyclerView.ViewHolder. Replace R.layout.item_tile as appropriate, to match the view used in each fragment. In each fragment, create a RecyclerView.Adapter instance, wrapping the ViewHolder that was just created. // Set numbers of List in RecyclerView. For each fragment, update onCreateView() to use the new ContentAdapter. Specifically for TileContentFragment, let's also take a moment to adjust the padding and tell RecyclerView to use a GridLayout — this will make things look nicer, since our tiles will be small. To complete the effect, let's style each view by modifying item_list.xml, item_tile.xml to include an image. In this step you'll learn how to use VectorDrawable by using Support Library support-vector-drawable. You'll be able to use VectorDrawableCompat back to API 7 device. By using vector assets app only need single vector assets for multiple device screen. 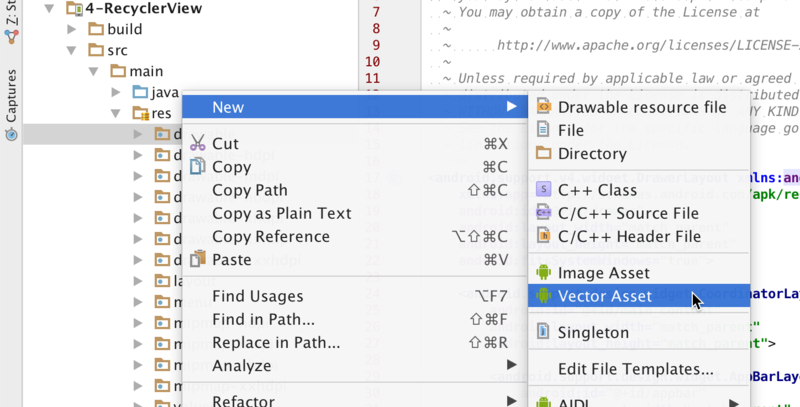 To import vector assets to Android Studio, press CTRL + Enter at drawable directory and choose New -> Vector Asset. For this codelab we will import favorite and share vector assets to style cards. Once you import vector assets, you can now use app:srcCompat instead of android:src to render images within cards by using vector support library. You can notice that we have favorite and share icons within card. The navigation drawer slides in from the left. It is a common pattern found in Google apps and follows the keylines and metrics for lists. Create a file menu_navigation.xml defining the navigation items under res/menu folder. Create a file navheader.xml defining a Navigation Drawer material under the res/layout/ folder. Encapsulate all the components within a DrawerLayout which enables interactive drawer views to be pulled out from the edge of the window. Add a NavigationView outside the CoordinatorLayout. Add the following code to the onCreate method of MainActivity.java to set the navigation drawer. Add mDrawerLayout.openDrawer(GravityCompat.START); to MainActivity.java to make the navigation drawer move when you touch the menu. 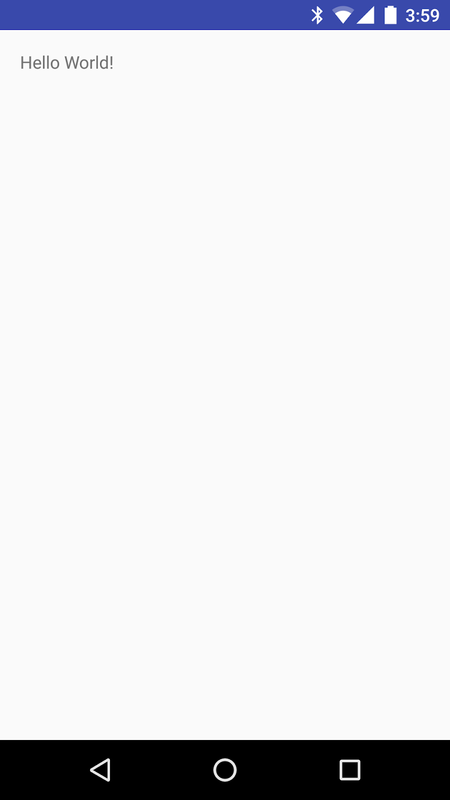 Floating action buttons are used for a promoted action and are distinguished by a circled icon floating above the UI. Let's create a FAB that triggers a SnackBar which provides lightweight feedback about an operation by showing a brief message. Not every screen needs a floating action button. A floating action button represents the primary action in an application. Only one floating action button is recommended per screen to increase its prominence. It should represent only the most common action. The floating action button doesn't need to be placed in the lower-right corner of the screen. Consider placing it in the upper-left or upper-right, overlapping with the Toolbar. A mini-size floating action button can also be used, for situations where you need continuity with other visual elements on screen. In activity_main.xml add a FloatingActionButton to the end of the CoordinatorLayout. 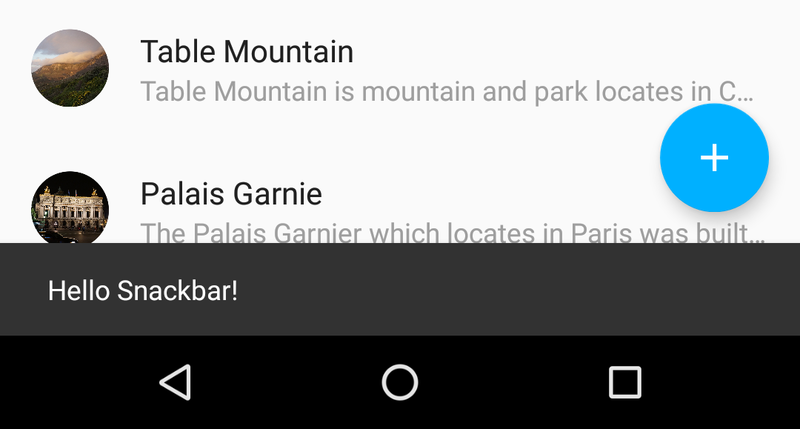 In values-v21 folder, update styles.xml to create system bar transparent for device running Android 5 and above. InCardContentFragment.java file add methods when buttons within card pressed shows snackbar. Notice the snack bar pushes the floating action bar out of its way as it's animated onto the screen. This behavior is facilitated by the CoordinatorView in activity_main.xml. As an experiment, try moving the FloatingActionButton outside of the CoordinatorView. (You'll need to define an extra RelativeLayout to make this work.) The snack bar will instead ignore the floating action button's existence while animating itself onto screen! 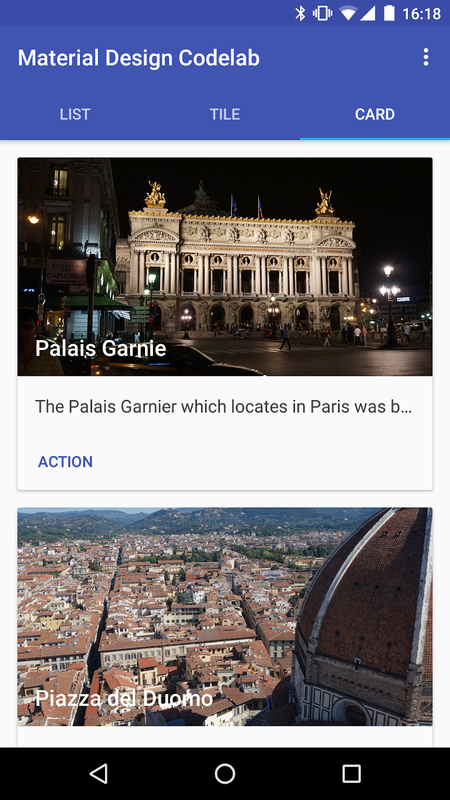 Since animation is an import part of the Material Design experience, make sure to wrap related views with CoordinatorView, and extend CoordinatorLayout.Behavior if any views need to implement a dependent animation. Create a new Intent within each of ListContentFragment.java, TileContentFragment.java, and CardContentFragment.java so that each item has a link to the detailed view. In order to have your activity show up make sure to add the activity to the AndroidManifest.xml file. In activity_detail.xml, add an AppBarLayout and CollapsingToolbarLayout within CoordinatorLayout. In DetailActivity.java set the title of the collapsing toolbar's detail view. Congratulations, you're finished! 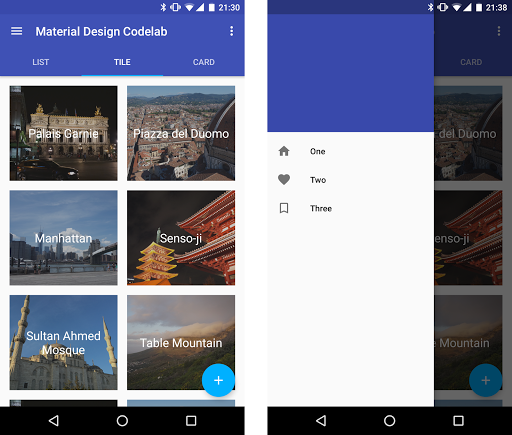 You're now ready to create a material design app. When you have a spare moment, we'd really appreciate if you could fill out some feedback on your codelab experience. We'll use this information to iterate and improve the codelab over time. 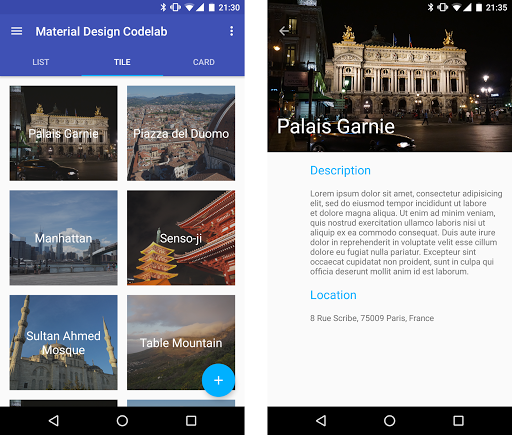 Now it's time to add material design to your own app. Then, be creative and try something that's uniquely you!